Preheat oven to 350 degrees F. Boil water and cook pasta according to directions. While pasta is cooking, heat tomato sauce over low heat in a large saucepan. Once warm, stir in heavy cream and grated parmesan. Once pasta is done cooking, drain and dump into the sauce, mixing to coat and turning off heat. Fold in mozzarella cubes and tomatoes, then chop 3-4 fresh basil leaves and add them in too. 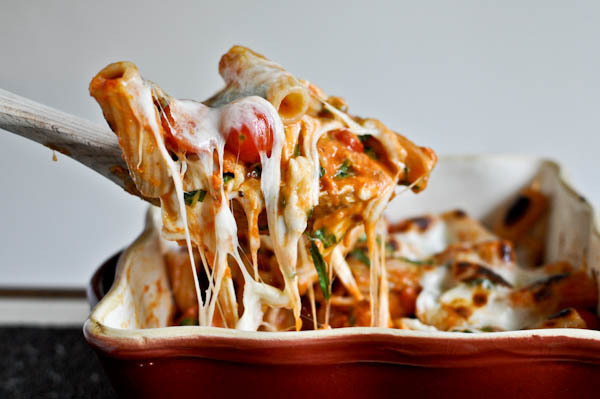 Once combined, spray a baking dish with non-stick spray and pour the entire pasta mixture into the dish. Top with fresh mozzarella rounds. Bake for 25 minutes, or until cheese is golden and bubbly. Top with additional fresh basil and grated cheese.